With Valentine’s Day just around the corner, you might be wondering how to make February 14th in New York City an unforgettable experience. Luckily, The New Yorker, A Wyndham Hotel, knows exactly how to make sparks fly. The New Yorker, A Wyndham Hotel, loves to spoil its guests. Book our Romance Package just in time for Valentine’s Day and make the most of the champagne bottle, complimentary late check-out, upgrade to premium View rooms and continental breakfast for two at our Sky Lounge. But there’s something still missing… V-Day’s dinner! Why don’t you head to Butcher and Banker, our old bank vault-turned-hot, new restaurant? Read all about it in our blog and be prepared for an extraordinary dining experience. The secret to a lasting relationship is knowing how to fall in love with your partner again, and again, and again. Nothing says intimacy like a sensual and lush massage. And a city like New York isn’t short of spas to escape to when the concrete jungle becomes a little too much. The Couple’s Spa, located on the Upper East Side, is tailored specifically for - you guessed it - couples! Choose from the Swedish Deep Tissue Massage, the Flower Bath or the Aroma Package. We’ve mentioned the myriad of activities available in Central Park during wintertime, but what you probably don’t know is that the park’s magical winter atmosphere increases a hundredfold when romance comes into play. And what better way to spend Valentine’s Day than by taking a leisurely stroll across Central Park’s most romantic hideouts? If you follow this blog, you may know our suggested tour of Central Park starting from uptown. This Valentine’s, head south to Ladies’ Pavilion, Bow Bridge, arguably the most romantic bridge in the park, Bethesda Terrace or the tree-lined Mall and Literary Walk. Sure, you can always buy the classic heart-shaped chocolate box… Or you can wow your loved one with a special twist: a chocolate-making class. Tache Artisan Chocolate shop is one of Lower East Side’s favorite local spots. 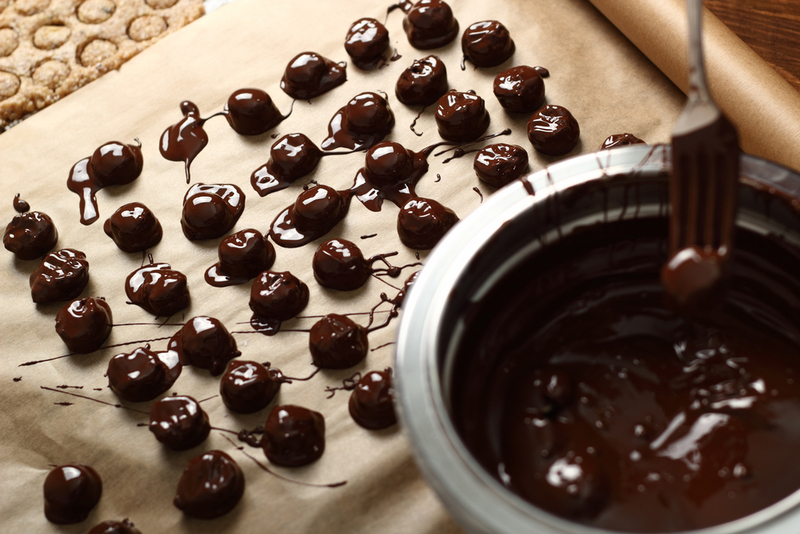 What’s not to love when handmade cacao creations are within your grasp? Learn chocolate-making skills from master chocolatiers - each class is between 1.5 and 2 hours long and includes a comprehensive course on everything from tempering to tasting and decorating your own chocolates. Book the class online and get ready to gain a pound or two - it’ll be worth it! When the gooey, Valentine’s Day atmosphere begins to close in on you, it’s time to shake it off. Gotham Comedy Club will be featuring some of its stars in a special Valentine’s Day show. You can pick from various packages that include drinks and desserts or a VIP experience. If, however, you’re up for a mellow experience, take a trip to Merchant’s House Museum for a night of rich, vocal music and masterpieces by Schubert, Brahms, Duparc, Dvorak and more - all while admiring the venue’s stunning architecture. Consider purchasing a ticket for the pre-concert reception in a historical parlor. What’s your favorite pick? Start celebrating V-Day by booking your room at The New Yorker, A Wyndham Hotel.